Another car that I miss having. This was, until I bought the Lotus, the fastest car I've ever had, and I'd say its not too far off the Lotus. Definitly the fastest car I'd ever got for free. Thats right. I was at work one day, and a guy I worked with was dissapointed because his 280ZX was sitting in his driveway, and a neighborhood freind of his hadn't picked it up yet. I asked him how long ago the freind had bought it, and he said he gave it to him for free (it had been in an accident), and that he told him to come get it. When I commented that I would have loved to have had the same offer, he replied that the first person to his house to get it could have it. I was there that weekend. 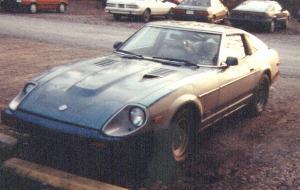 The car was bought new by my co-worker who raced Nissan Z cars as a hobby. He had a bunch of 240Z's but used this as his daily driver. After a few years, he modified it, put in a digital distributor, a new exhaust, and some other performance parts, along with some A.R.E. rims, wrapped in 235's all around. He raced it for several years, and I believe he had a good bit of success with the car. He then took it off the track, brought it back to street legal, but left on most of the performance mods, and it became a daily driver once again. One night he hit a deer driving along the highway. He and the car were ok, but the fender was damaged, the windsheild was completely trashed. The seller had the ability to fix it himself, no problem. He just didnt want the car any more. (Well, it was rusted bad (frame) and had 278,000 miles on it). I got a fender for $15, a windshield from a parts yard for $40. Dad and I put in the windsheild (a shop wouldnt do it, they said the body was damaged and wouldnt want to do the job for under $500. I just used bondo to make it fit - it worked fine). The fender I painted ($6 in spray paint) and threw on there. You could tell it was hit. The fender looked painted, but not at first glance. For under $100, I had a nice looking rocket of a car that made it through one semester of school. 130+ Mph on Rt 422E, just past state college, PA.
After coming out of the turny section at 100+ Mph. It reached about 131/132 with the pedal not floored." The guy I sold it to (for $800 with 292,000 miles) bought and sold Corvettes, and said it was faster than just about every Corvette he's ever had. He had plans to rebuild the frame damage, and race it a bit. 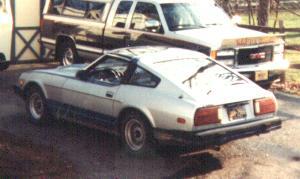 Couple other quirky stories regarding the Z.
I had a 'wobble' develop in the rear tire. I thought it was a bent axle or something equally as expensive. I just stopped driving the car for a while. Finally, I had no choice but to drive it home, which was 6 hours away. I figured if it died, I'd leave it for dead onthe road, and find a way home. I made it to the gas station in town, and went to fill up. I looked at the tire itself to see if it might need air, and noticed it was egg-shaped. The rubber had burned off so far, it went thoguh the tread, then through the steel, then the rubber under there, another few layers of steel, and to the white fabric inside, wearing off so much that it warped the shape of the tire. I asked the mechanic at the gas station if he had anything he could replace it with, perhaps a used tire. I ended up replacing a 235/45r15, with something like a 185/60R15. I told him he didnt even need to balance it. It was a whitewall. I remember the tire and mounting coming to less than the cost of my gas. I think it was $12. This is Slippery Rock, PA. You can get those kinds of deals on used tires. The guy took a shop light and held it inside my old tire, and you could see the light from the outside. He placed a piece of cardboard inside the tire, and on it he wrote "On [insert date] this tire was DRIVEN in to my shop". He hung it up from a hook, and said he'd never seen a tire that bald that was still driving. It still hung there a few months later, and for all I know its still hanging there. On another trip home, my exhaust fell off. Well, about 90% off. I decided to do a quick fix. The only thing open was a hardware store, so I bought some rain guttering, and some heavy wire. I went to the parking lot, and proceeded to rip off the old exhasut, which was hanging by a thread. -----Learn from my mistakes: Dont drive 3 hours, and attempt to forcfully grab a hot exhaust pipe.----- After a fair amount of kicking, it came off, and I drove (or you could say limped) it home with the guttering. Once I was home, I could go to the Slippery Rock Auto parts store. My muffler had come off withe the rusted pipe, but I really didnt need a new one, a straight pipe would do. I had noticed with the guttering that performance increased. And it wasnt *that* loud. Well, they had a 2 foot piece, and a 3 foot piece. I needed 2 feet, 4 inches. The short one would let fumes in to the car. So, there I was, driving around with 8 inches of straight pipe sticking out of the back of this Rocket. It looked much funnier than this picture lets on. 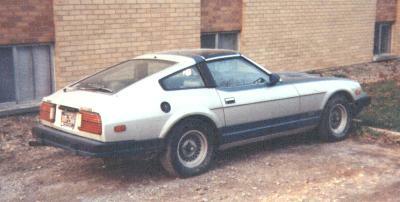 The last story of the 280zx, was the last weekend that I owned it. I had acquired it in the summer time, and it was now Christmas, I was driving it home having already agreed to sell it to a guy back there. My freind Matt Glenn (better known as Tweak) and I drove the car back home, a 7 hour trip. I commented as we were about 30 minutes in to the drive that I was really going to miss taking the T-Tops out of the car like I did in the summer time. To know Tweak, and to know how we get when we are around each other, you knew what was about to happen after that comment. It was about 30 degrees, there was snow on the ground, and we were pulling over to take out the T-Tops. At first, it was pretty damn cold. We thought we'd go all out, and have the windows down, but this was getting out of hand. We decided the trip would be much easier with hats and some eyewear, as our eyes were watering pretty badly. We pulled in to a little convience store to look for hats. The only type they had were fluffy Santa hats. We wouldnt have it any other way. Add to that some 99 cent sunglasses and about 5 boxes of 100 candy canes and we were set. If there was a single spot on that car where we could hang a candy cane, it was there. 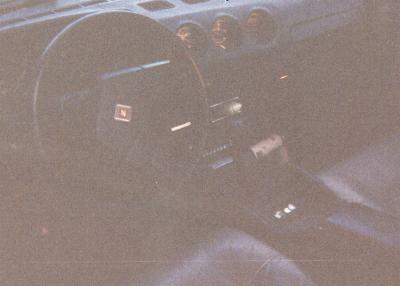 Off the rear-view mirror, around the T-Top area, on the dash, on the headrest bars. Pretty much everywhere. Not a person that passed us didn't stop to look. The people that seemed in to the whole thing, we'd throw candy canes at them until they rolled down the windows or until they drove on. We were even passed by a fraternity brother of ours, Robert "Tinman" Smith, who looked over, nodded his head as if he'd expect that out of the two of us, and continued to drive on.